Get even more for your valuables! B’nB Broker Buyer offers competitively priced grading and authentication services for any customer looking to find the true value of their items. Sit back, relax, and let our experts handle all the time-consuming paperwork, shipping, and correspondence needed to get professional certification for your item. B’nB uses only the most trusted names in diamond and coin grading as well as sports memorabilia authentication. Contact us today for rates. What’s the difference between grading and authenticating? Grading looks at the physical characteristics of an item and marks it against a system that will help define its value. For example, diamond grading is based on a 4C scale that evaluates a diamond’s color, cut, clarity, and carat weight. Authenticating will determine if your item is genuine and described as claimed. Professional authentication services use reputable experts who specialize in detecting counterfeits and forgeries to verify whether an item is as represented. Assurance and peace of mind that your item is the genuine article as you were told. Added value, in some cases doubling or tripling your asking price when selling the item. Select laboratories can catalog your item, making it easier to track if ever stolen. Insurance companies may require certification for an item before accepting it on a policy. 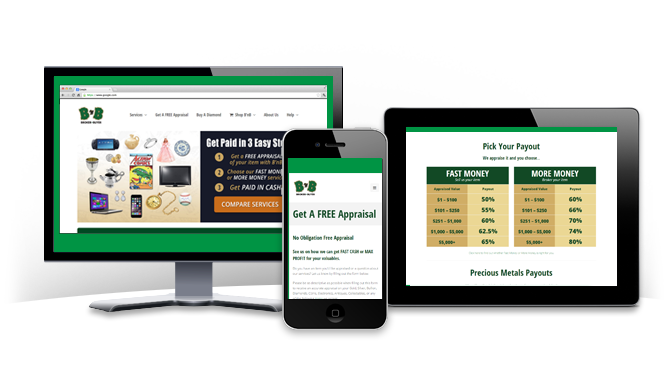 Submit your item for review in only a few short minutes using our B’nB FREE Appraisal Form. When filling out your information, simply choose whether you’d like to have the item graded or authenticated in the form’s “How can we help you?” field. B’nB Broker Buyer uses industry leading and internationally-recognized diamond, coin, and sports memorabilia authentication labs to ensure safe handling of your item and fully detailed reports on their findings. Regardless of location or marketplace, their certifications are a common language of trust and confidence and are widely considered an essential part of any transaction of significant value. The Gemological Institute of America, or GIA, is a nonprofit institute dedicated to research and education in the field of gemology and the jewelry arts. Founded in 1931, GIA’s mission is to protect all buyers and sellers of gemstones by setting and maintaining the standards used to evaluate gemstone quality. The institute does so through expert research, gem identification, and diamond grading services using their “4C” scale and International Diamond Grading System – the worldwide standard for evaluating diamond quality. GIA employs hundreds of highly trained diamond graders, gemologists, and research scientists who scrutinize diamonds and analyze them, depending on size, with as many as 40 pairs of eyes for each stone. GIA laboratory experts have graded some of the world’s most famous diamonds, including the legendary Hope Diamond (45.52 carats) and the De Beers Centenary Diamond (273.85 carats). Around the world, IGI certificates bring confidence when buying or selling diamonds, gemstones and jewelry. Total commitment to understanding consumer concerns has motivated IGI to develop comprehensive analysis and clear documentation for consumers. This empowers jewelry buyers to focus on finding precisely what they want, with full assurance in the integrity and quality of the IGI certification. With more locations around the globe than any other laboratory, IGI is the world’s most trusted name for the expert and impartial grading of diamonds, gemstones and jewelry. The Numismatic Guaranty Corporation, or NGC, is the official grading service of the American Numismatic Association and is globally recognized for it’s consistent and accurate grading of US, World, and Ancient coins. Having your coins NGC graded guarantees potential buyers of their authenticity, making them readily accepted by authorized NGC member/dealers as well as other dealers across America and around the world. Each coin will return to you encapsulated in a securely protected EdgeView holder using inert plastics and sulfur-free paper, identical to the ones used by the Smithsonian to house some of its most important coins, to keep them safe and securely protected from corrosive gases and moisture. Also included are security measures, such as our industry-first security hologram, bar code and coin identification number, make insurance protection and cataloging easy. Professional Sports Authenticator (PSA) is the world’s largest third-party authentication service. With PSA behind your collectibles, there is no more guesswork or taking the word of one dealer over another. Now you can have your collectibles graded by an unbiased group of the hobby’s top experts — and at the same time be assured that the only interest they have in your collectibles is to make sure they’re properly graded and carefully preserved. PSA’s grading standard is recognized industry-wide as the best possible form of consumer protection. So when you see a collectible for sale, displaying the PSA logo, you’ll know you can buy with confidence that it has been properly graded. If you want to verify the grade of your item before you sell, have it graded by PSA and realize its full value without leaving any money on the table. For long-term storage, PSA’s tamper-evident holder offers the most visually appealing form of safe storage known. Our protective insert and optical-grade plastic holder will help keep your top collectibles in great shape for years to come. Welcome to the new CNYBNB.com!